Winter can be challenging for any livestock operation and without proper attention, it can lead to problems. Dairies with robotic milking systems are no exception. With temperatures dropping outside, inside the barn there are a multitude of possible issues happening if there is not proper preventative maintenance. 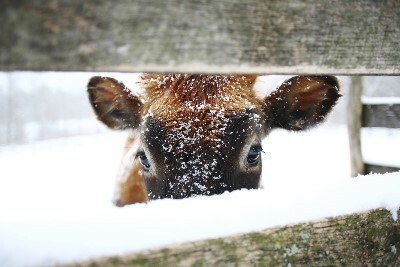 Problems dairy producers may encounter include frozen water hoses, cords, water troughs and, in some cases, frostbite for cow’s teats. All of these issues will affect your cow’s visit to the robotic milking machine, yield and, last but not least, your own (unplanned) workload and efficiency. Roger and Joanmarie Weiss, along with their daughter Margie, operate Weiss Centennial Farm in Frankenmuth, Michigan. They consulted with other robotic dairy owners before adding a Lely robot to their operation in 2011. Stehouwer also says that sometimes the first things to freeze up are the ropes underneath the robot arm during milking as they can be exposed to cold winds. When possible, prevent the ropes’ exposure to freezing cold by pumping warm air pressure from the milking cooling or compressor room to the robot room. If this air can be blown underneath the cow and the robot arm when the rest of the room is sealed, frozen ropes can be prevented. “In addition, keep the ropes greasy and keep water out of them by soaking them in silicone spray or Vaseline,” Stehouwer says. He says there have been milking robot barns installed with freezer curtains around the robot that create a warm air pocket around the robot. “This resolves all issues, but the cows need to get used to it and it requires construction,” Stehouwer says. Choosing a teat dip that has additional skin conditioners to help protect the cows teats against little cracks and frost damage. Lely Consumables offers a wide range of products to help your robot running smoothly. The Lely Astri-UC Udder spray is especially developed for changes from warm to humid or cold weather conditions. Adjust the automatic ventilation control and put fan covers on to make sure barn curtains are in good shape. If you use heaters within your robot area, test them in advance. If your robot area is sensitive to cold airflow think ahead about how to stop this and what kind of materials you might need. Buy these materials in advance. Typically rough or worn-out cup cords are more sensitive to frost. Check your cup cords and replace them when necessary. As stated above, you can spray cords with silicone if needed. Check and calibrate the correct proportion of water and chemicals for cleaning. If you are using a so-called ‘heating ribbon’ for your water supply, check its function. If you have insulated your water pipes, visually check the insulation. Check that the water boiler is working properly and keeps reaching the desired temperature. Ask yourself whether your footbath management should be adjusted to wintertime. Do you really want footbaths in freezing cold temperatures? Get out a few more mouse traps and catch rodent early in the winter before they start eating wires. Overall, think in advance about any mechanical issues that could occur on your farm in wintertime and act proactively. If you have any further questions about keeping your milking robot barn running smoothly, you can look at the product manual or you can call your local Farm Management Support team.